Hi guys, I'm back! I know I've been MIA for almost 2 weeks without any updates here. Truth is there are just too many things to blog about but I have been really tight up with work, family and other things these past few weeks. 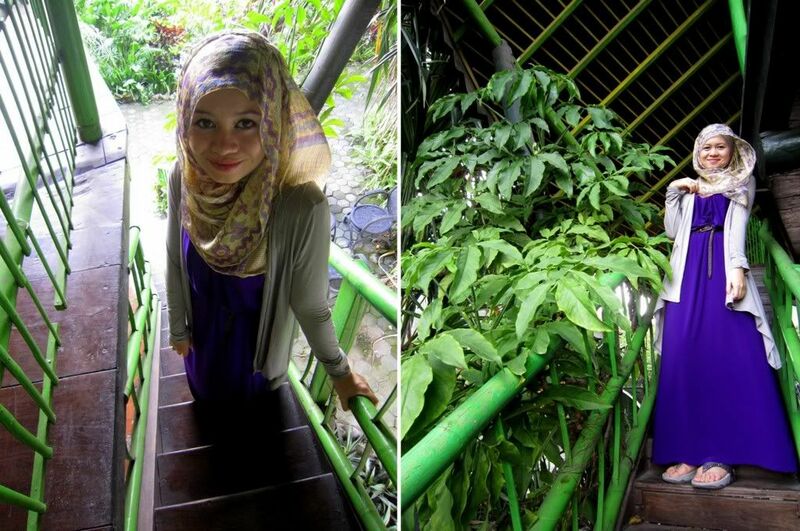 In fact, I just got back from my brother-in-law's wedding just now. 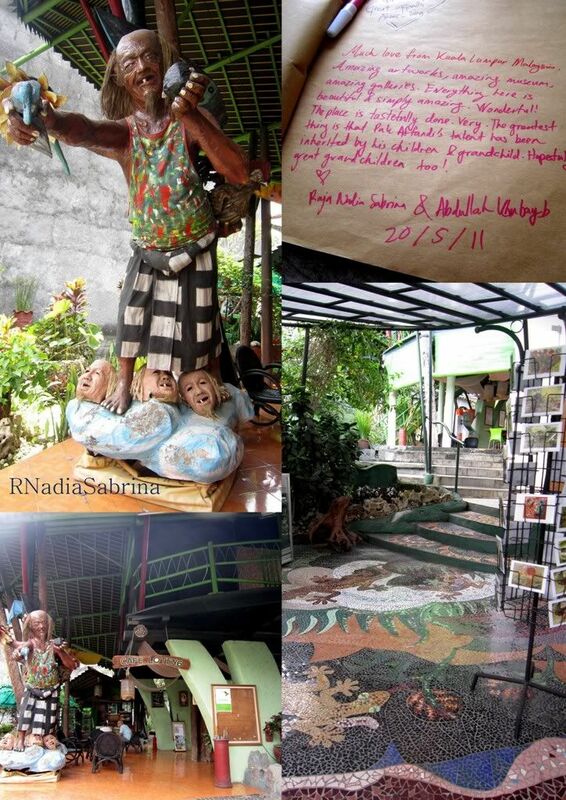 This has been long due so I'll just do a quick post on my visit to the incredible Museum Affandi in Jogja the same day I went to Kraton. The late Affandi was an Indonesian artist from humble and simple beginnings, who started out drawing from left-over paint when he was working as a painter doing movie posters and billboards. He became famous and was then known worldwide for his unique expressionist paintings. The museum was one of the first places I planned and in fact I wanted to go there on my first day in Jogja (but I had to shuffle my plans). I can't describe how excited I was to go here. 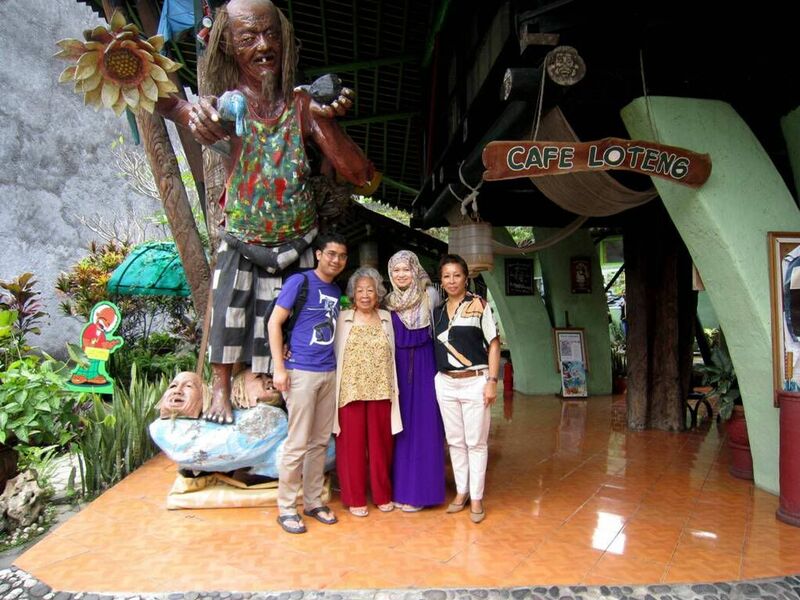 We went there with Ibu Kartika, Affandi's eldest daughter (also my dad's friend) as her guest. I guess I'll have to blog about her in another post. So here I was, after arriving at the museum. The whole building s architecture was individually unique and the interior and exterior of each building was really artistic. 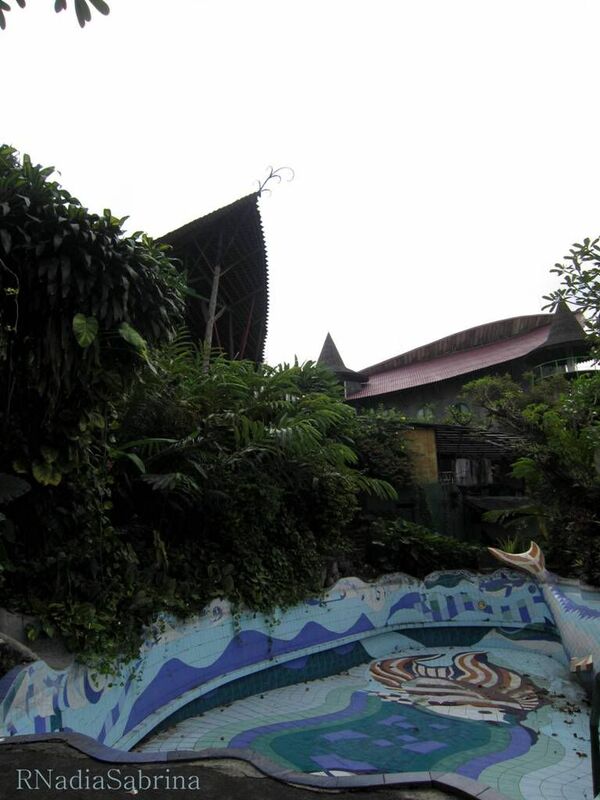 The whole compound was where Affandi lived (his several houses were all in the compound) and it was even where he was buried. 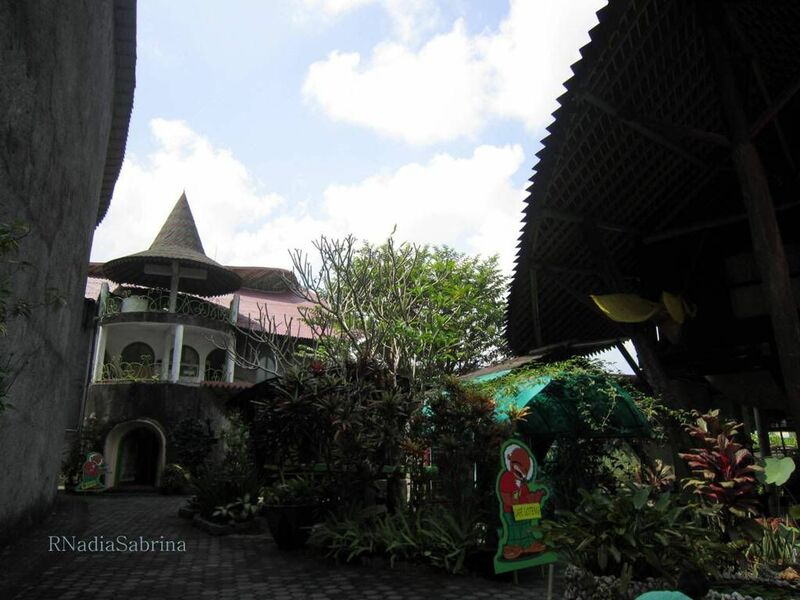 The compound now houses 4 galleries of Affandi's paintings and personal collection as well as his daughters' and grandchildren's paintings. The museum cafe and the gift shop. 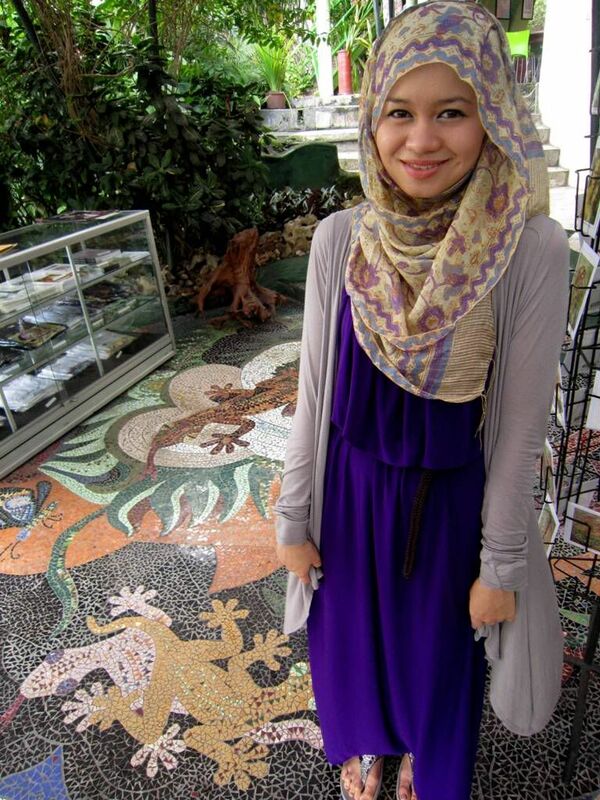 I love the designs on the floor. 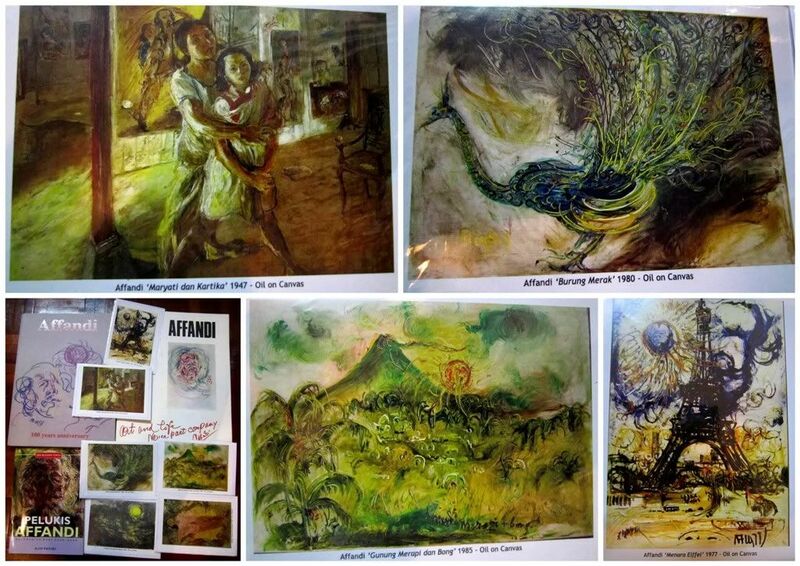 They sold postcards of Affandi's most famous paintings. Got myself some of my favourites and also some books. Nothing beats seeing the gorgeous paintings in real. 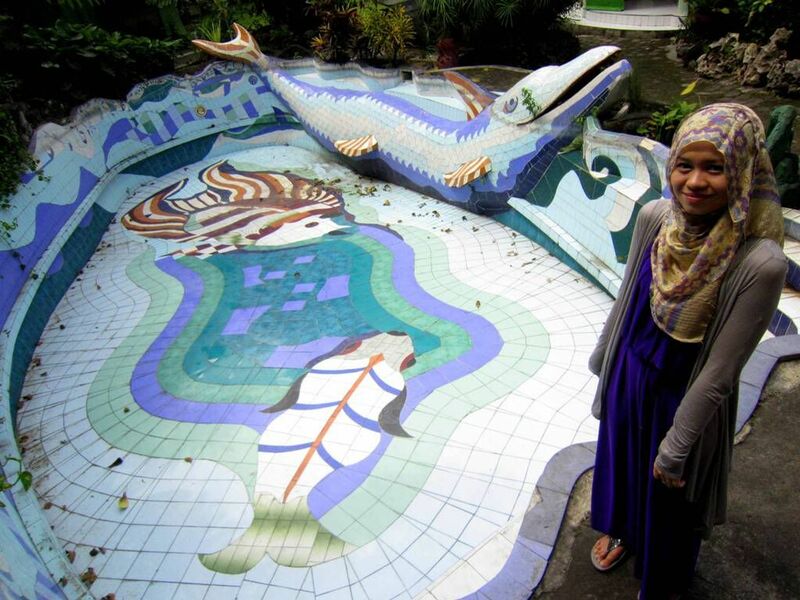 Affandi's swimming pool. Isn't he just a funky, artistic genius or what? The staircase in one of his galleries. If you notice closely, the steps resemble human hands. I love it! 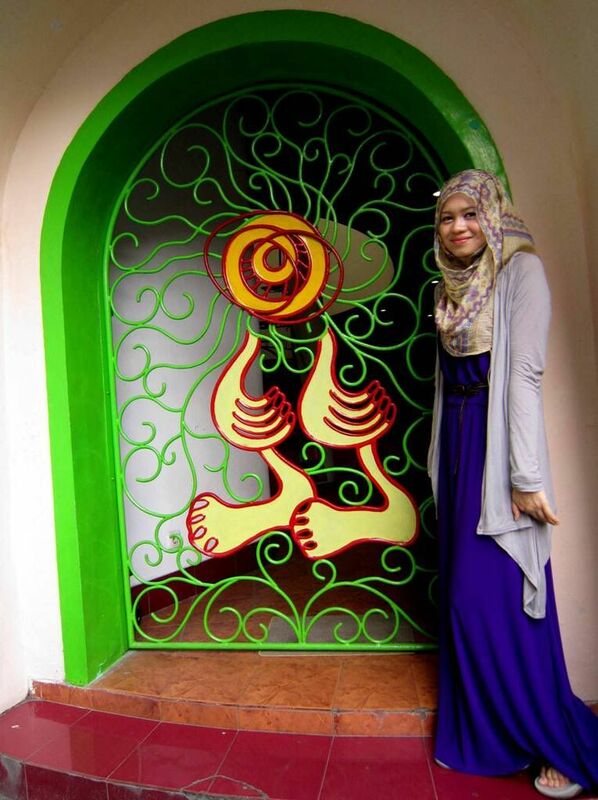 Going up to see one of Affandi's bedrooms. He had a few. This one was in a tree house. 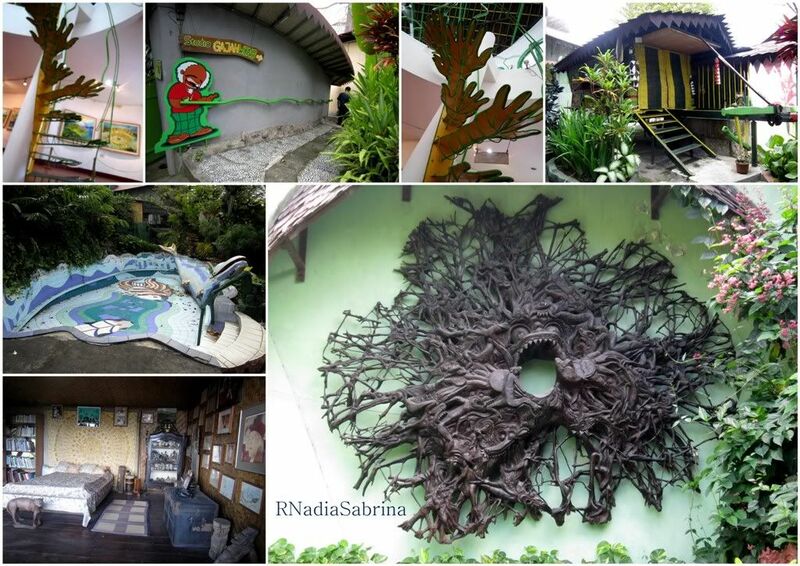 Pictures of his bedroom, the hand-shaped staircase, his other bedrooms (one looked like a carriage, the bottom left is the one in the tree house) and a fascinating sculpture on the wall above his grave. 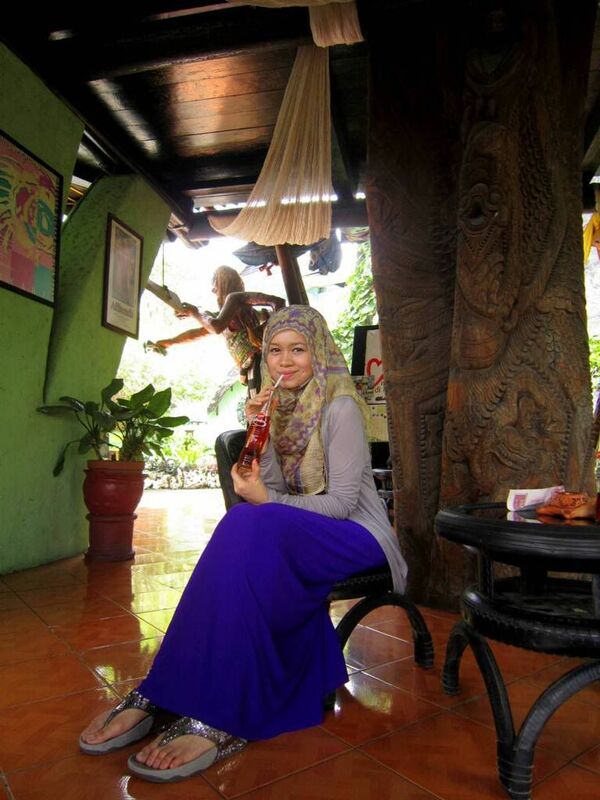 After finishing walking about in the museum, I just had to have a teh botol to quench my thirst. 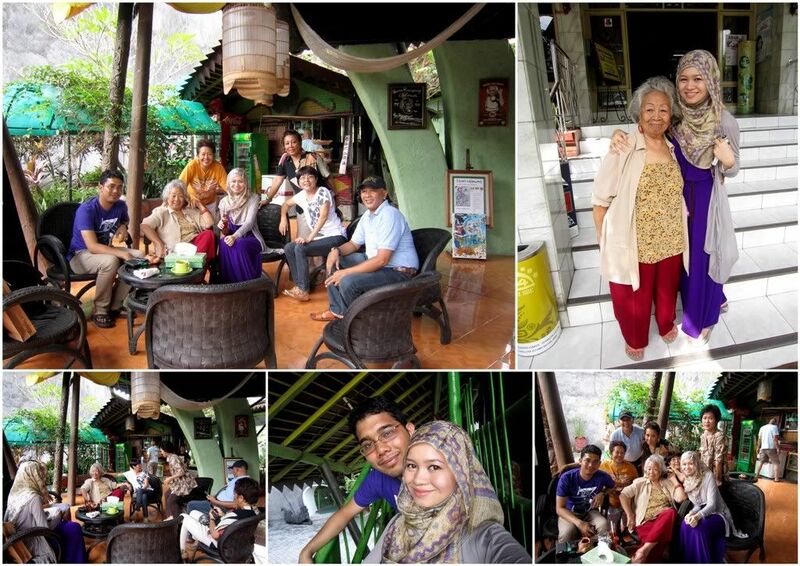 Spent some time talking to Ibu Kartika and her many daughters and son. They had so many siblings it was fun to see them interact. They are a very close-knit family. They insisted that I try this Es-nangka. 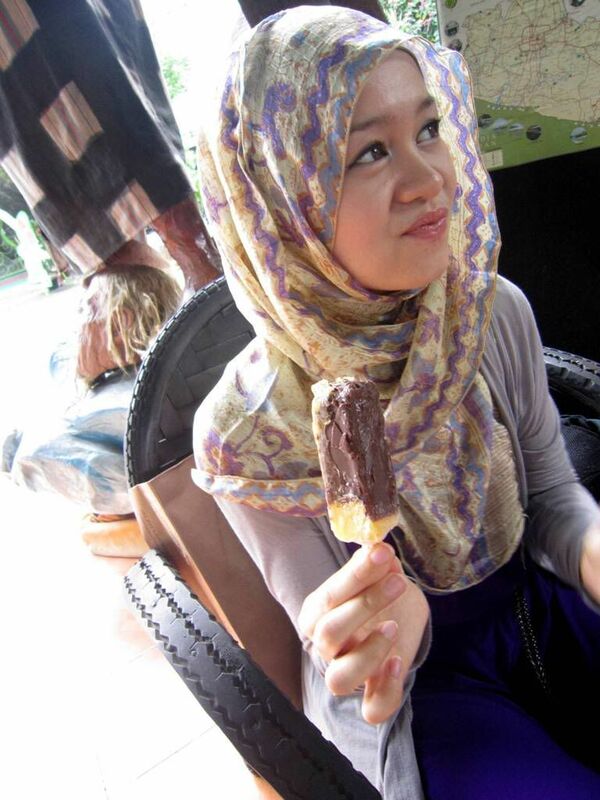 Nangka (jackfruit) Ice-cream coated with chocolate. It was really delicious and so so nice on a hot day. Hubs tried the Es-kelapa (coconut) ice cream and he liked it too. Just had to take another pic of the pool before I left. Guys, do pay a visit to the museum if you're there. It's not boring like other museums. I was really sad that I couldn't take pictures inside the galleries to share his paintings. But they were really, really good. The guide will also explain Affandi's life story through his paintings and it will give an insight of how he led his humble life. LOVE YOUR SLIP ONS. WHERE DID U GET THEM?